It’s pretty straightforward to back up your business’ data, but it’s an entirely different process if you want to take Business Continuity Planning seriously. Making the assumption that your servers will never go down, or that a natural disaster could never possibly impact your business, could cost you big time. To most of us, this is not surprising news. Most businesses have a backup solution in place. But simply having backups somewhere does not guarantee that your business will be able to continue operations in the event of data loss due to equipment failure, natural disaster or end user error. 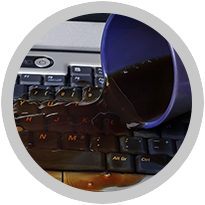 Will your attempts to restore mission critical data succeed? 60% of restores from tape do not. Hit by a virus or worm? Are you sure that your backups are not also corrupted? If your data center is down or inaccessible, what do you do? In the event of a catastrophic failure of a server, a company with backup only might have their data secure, but the recovery time to get back to where you were the minute before the failure might be as much as 4 days to a week. With a sound business continuity plan, however, recovery time is often measured in minutes instead of days. 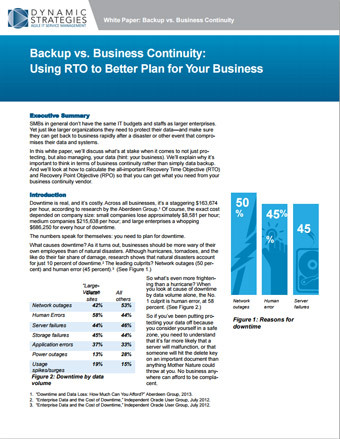 That, in a nutshell is the difference between backup, and Business Continuity. View the video below and download the free whitepaper to learn more about the things you can do to protect your business from outages of any magnitude. To learn more about how business continuity planning can keep your business up and running, contact VelocIT today. Small – to Medium-Sized businesses in general don’t have the same IT budgets and staffs as larger enterprises. Yet, just like those larger organizations they need to protect their data and ensure they can get back to business quickly after any event compromises data and systems. According to research by the Aberdeen Group*, the average cost of downtime across all businesses is a staggering $163,674 per hour. The exact cost, of course, depends on the size of a company with small businesses losing approximately $8,581 per hour, medium sized businesses losing $215,638 per hour, and large enterprises losing a staggering $686,250 for every hour of downtime.